The Athenian Treasury (Greek: Θησαυρός των Αθηναίων) at Delphi was constructed by the Athenians to house dedications made by their city and citizens to the sanctuary of Apollo. The entire treasury, including its sculptural decoration, is built of Parian marble; its date of construction is disputed, scholarly opinion ranging from 510 to 480 BCE. Pausanias mentions the building in his account of the sanctuary, claiming that it was dedicated from the spoils of the Battle of Marathon, fought in 490 BCE. The building was excavated by the French School at Athens, led by Pierre de La Coste-Messelière, and reconstructed from 1903–1906. 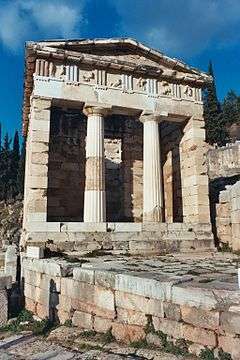 The structure is still visible in situ, although the metopes are reproductions; the originals are kept in the museum of Delphi. The thirty metopes of the treasury, c. 67 cm tall and 62–64 cm wide, nine along the long sides (north and south) and six along the short (east and west), depicted the labours of Herakles and Theseus. This is the earliest surviving juxtaposition of the two. The platform upon which the treasury stands has a prominent inscription on its south face; it is dated internally to post-490 BCE. 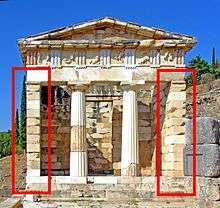 The Athenian Treasury in Delphi was built according to a typical distyle in antis design, with two antae framing two columns. The ancient writer and traveler Pausanias was “emphatic that the Athenian Treasury was built [meaning financed] from the spoils from the landing of the Persian general Datis at Marathon”. This means that a date later than 490 BCE, after the Battle of Marathon and accounting for time of construction, would be acceptable to Pausanias. Despite being a primary source, Pausanias on occasion may have been misguided or misinformed, and classical scholars still maintain the date debate. John Boardman notes that “on a purely archaeological, architectural and stylistic grounds the Treasury has appeared to many scholars to date to around 500 BCE, and some would put it earlier”. Left image: Characteristic shape of the Doric anta capital. Right image: Doric anta capital at the Athenian Treasury. ↑ "Athenian Treasury". Retrieved November 3, 2009. ↑ "FD III 2:1". Epigraphy.packhum.org. Retrieved 2012-03-19. ↑ Boardman, John (1982). "Herakles, Theseus, and Amazons." The Eye of Greece: Studies in the Art of Athens. Cambridge: Cambridge University Press. p. 4. ↑ Boardman, John (1982). "Herakles, Theseus, and Amazons." The Eye of Greece: Studies in the Art of Athens. Cambridge: Cambridge University Press. p. 3. ↑ Neer, Richard (1982). The Athenian Treasury at Delphi and the Material of Politics. Classical Antiquity 23. p. 67. Wikimedia Commons has media related to Treasury house of Athens in Delphi.